Those of you who know me won’t be very surprised to find that this report got away from me a bit. 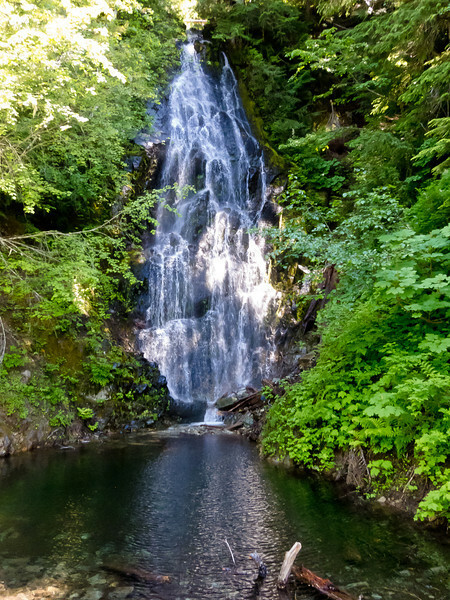 If you get tired of the details I recommend skipping ahead and looking the mountain and waterfall pictures. I’m a bit apprehensive because this year has been disappointing from a training perspective, and I think I have fewer miles in my legs at this point than any year in the last 5. 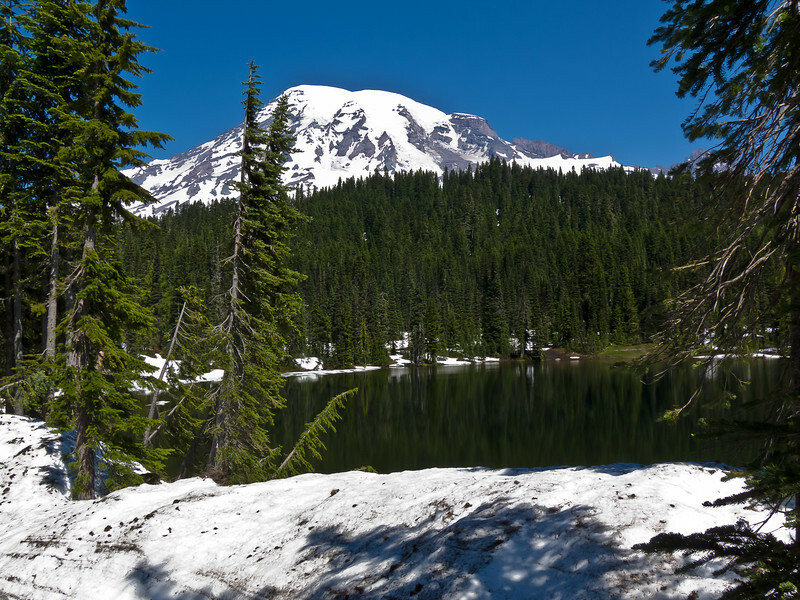 A long ski season, a very wet winter and spring, and some family issues conspired to put me behind where I would like to be. And on top of that, I’ve been having some shoulder and neck issues that are limiting my time on the bike. Did you catch what I did there? I bet you didn’t. You *thought* that I was merely describing my cycling-relating challenges for this year, providing an intro to what promises to be a very pedestrian narrative (In the “unremarkable” meaning of the word, not the “walking” sense… (I hope…)). I *was* doing that, but I was doing something far more important. I was establishing my excuse. The artful establishment of an excuse is what separates the experienced cyclist from a beginner. Notice how I’ve fixed in your mind that there are several reasons my conditioning might be suspect, and, most importantly, the majority of them are NOT…. MY…. FAULT…. If, it turns out I run into issues later in this ride report, you will recall the excuses, and not attribute any of those issues to a) my lack of cycling talent, or b) my well-documented aversion to training pain. And the most impressive part is that you will do so, despite me having told you all about this, because you will remember the most important thing. If you have a pencil and paper handy, I suggest you write those 4 words down and circle them. So, anyway, I’ve been at RAMROD the past three years, and despite a lot of work and a whole lot of time in the saddle, I have never completed the ride. In 2007, I trained well and rode well, but was unable to finish the standard course, because there was a road washed out on the south side of the mountain and the ride didn’t actually go around the mountain. 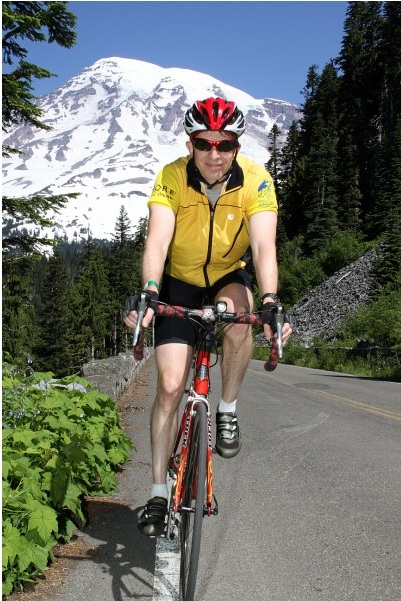 In 2009, I felt pretty good and was also unable to finish the standard course, because the road as still closed, but we did get to visit Packwood and ride up Cayuse pass in 100 degree heat. 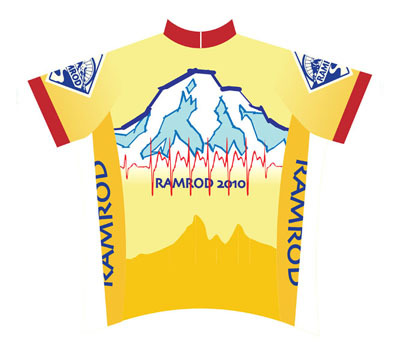 So, that year I technically did ride around Mount Rainier in one day, but didn’t really do RAMROD. And last year, last year was a fiasco, where I didn’t come close to finishing the course. On the way to the ride I’m a bit apprehensive. I’ve already shared with you my excuses – which I have come to terms with – but I didn’t tell you the whole story. I keep track of my resting (sitting) heart rate to track my overall fitness; earlier in the spring it was about 48, but in the past few weeks it has been in the 42-44 range. That’s pretty good – not as fit as I’ve been a few years ago (when it was <40), but pretty good. Tuesday morning I wake up really tired, and head to work. While I’m in a meeting, I check my heart rate, and find that it is 62. That is bad; it means that something weird is going on, probably some low-grade virus. After work I’m planning a last taper ride, but it takes a lot of effort not to just lie down and sleep. The ride makes me feel a bit better, but I don’t really feel comfortable on the bike. Those of you who paid attention in English Lit have probably identified an element of foreshadowing. I show up at the school (at 4:05; I could have slept in another 30 minutes), pick up my packet, and head inside to warm up, and to watch others eat their giant breakfasts. I put my number on my jersey, and then read through the route to make sure I know where I’m going. That’s a bit of a joke; the course is very well marked and you pretty much just have to remember to turn left. Camera (my new Canon S95), smart phone (Windows Samsung Focus), and tic-tac container of ibuprofen and salt capsules go in the bento box. 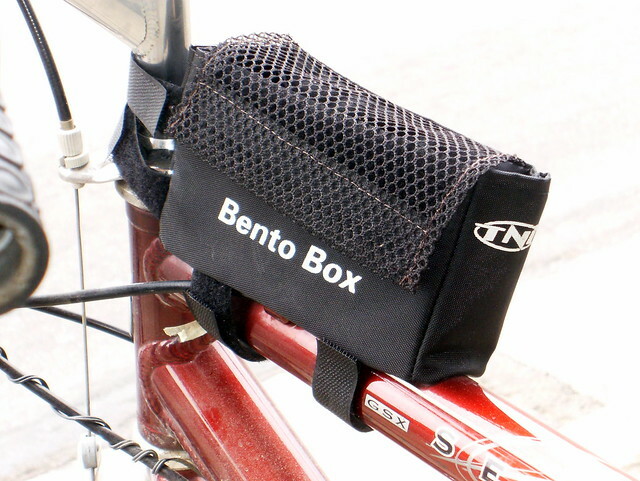 Wallet and keys go in my tail bag (it already has a tube, patch kit, inflater, pump, and a couple of gels). Jersey gets 5 refills of Accelerade in snack ziplocs, a bunch of nuun tablets in a ziploc, a bag of jerky, a bagel, and a package of power bar bites. I pull out with my sunglasses in my pocket (‘cause it’s dark) and spin along for the first few miles, my eyes tearing from the wind (I wear contacts). I’m shivering and my feet are very cold. My toe warmers are doing much to keep my toes warm, though to be fair they usually work better when they aren’t in my bike bag in the truck, so I shiver, zip up my coat, and start paceline shopping. I’m fine riding alone in this section, but riding in a group is more fun and helps you save energy. If you have my level of training, you need to be very careful; there are some fast riders in RAMROD and it’s easy to jump in a paceline that is too fast and costs too much energy. A few groups go by in the 23-24MPH range, which doesn’t fit into my budget. After a few minutes a nice one goes by at about 19MPH, and I hop on the back (at RAMROD just hopping on is acceptable behavior). It’s great for about 5 minutes, but it turns out that the guy who is at the front is also shopping, and he grabs one at 23MPH that comes by, the middle part breaks off, and I slow down. 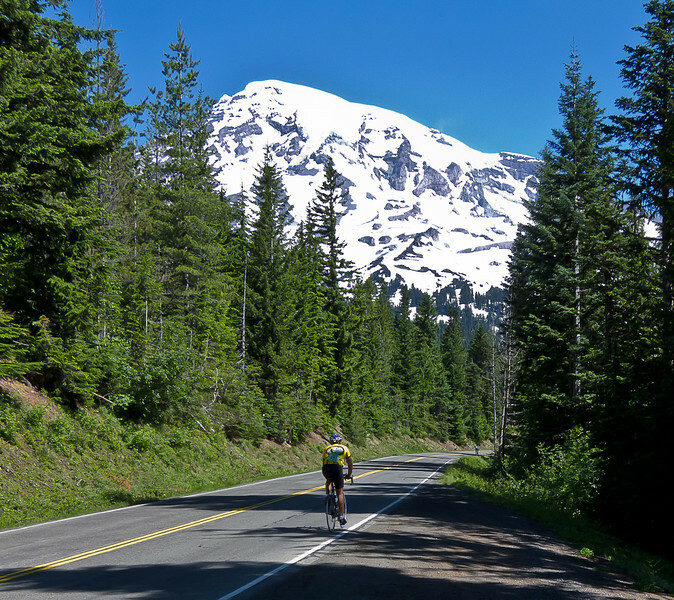 A few miles go by and I find myself alone; for 20 minutes I enjoy the views, until I finally catch up with a guy, grab another small paceline, and roll into the Eatonville rest stop. I grab a blueberry biscuit scone thingy, and mix a new bottle of accelerade. Even though this is a “flat” part of the course, we climbed just under 1000’ getting here. As I’m getting ready to pull out, my associates Tristan, Francis, and Michael pull in. They are riding together and generally faster than me, so I say hello and head out; I’m sure to see them soon. At least my feet have finally thawed out. The first real hills show up here; a few short climbs in the 7%-8% range and then a steady 1-2% climb for the rest of the section. I’m awake but not really feeling much zip, but I find a small group to ride with. We keep an unimpressive but steady pace, and I spend some time talking with a woman who is on her first RAMROD. After a while we pull into the food stop before the park entrance. I have a cookie, some cheese nips, and take a couple of ibuprofen (my neck and back are already hurting), and a salt capsule (I’ve had sodium issues before). I run into Michael and chat for a minute; he has dropped back to ride his own pace, which is very likely faster than my pace. Before I head out, I take off my vest, fold it up, and stuff it up the back of my jersey. I’d rather be without it, but we’ve been through a lot together, and my team car is nowhere in sight. I’ve picked up another 1300’ of elevation gain, and we’re now sitting at a bit over 2000’ of altitude. We ride a mile or so from the food stop, and then enter the national park. Volunteers take down our numbers (so they know where to look in case somebody doesn’t show up), and we start climbing. Which isn’t really correct; we’ve been climbing since Eatonville, so it’s more of a continuation on the last section. The first few miles are tame, 1-3% grades, but they aren’t as easy as the should be. People start to pass me. Then the grade kicks up to 5%, and we start the meat of the climb, and I’m pretty miserable. I’m having trouble making any real power, which means I’m stuck in a my lowest gear, my back hurts and my neck hurts. There’s a saying that applies to situations like this, which goes by the acronym HTFU. So, I HTFU, and keep climbing. Large groups of people pass me. This is a bit disheartening, but not that surprising; since I left at the start of the ride, the only people who I could pass are those who went out too fast in the first bit and are hurting more than I am. The total population of that segment numbers 1, and we talk for a while before he pulls off to take a rest. As I climb, I do a few calculations in my head. I’m climbing at about 6 MPH, which means it takes me 10 minutes to travel a mile. The gradient is 5%, which means that for every mile I travel I gain about 250’ of elevation. I have a couple of thousand feet to climb, so it’s going to be 2000/250 = 8 miles, and at my current speed it will take… way too long to think about right now. So, I keep climbing. (For those playing along at home, the answer is “8 miles at 10 minutes per mile will take Eric 80 minutes to climb”). At about this point, I remember that I have my camera with me, and resolve to stop and take some pictures along the way. That’s a great way to take a break without looking like you are taking a break. Rocks. I have never seen such beautiful rocks! 1) Mt. 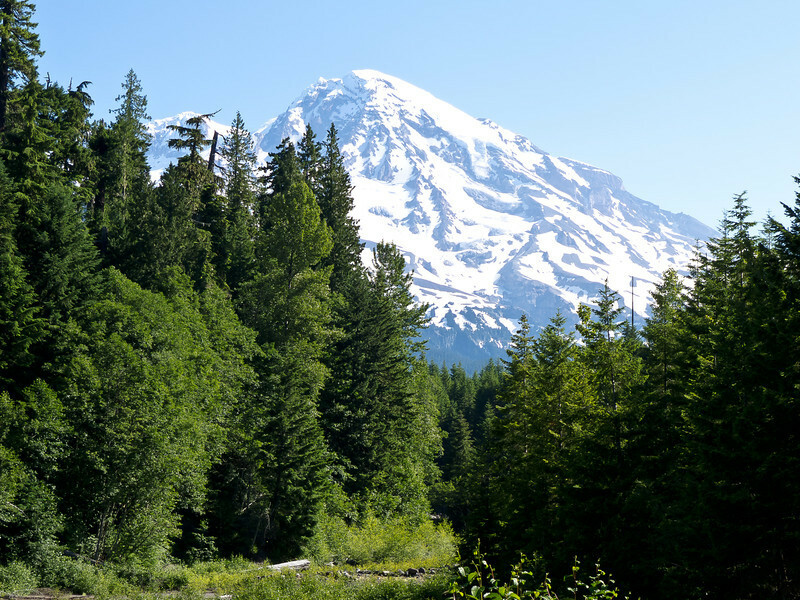 Rainier is a stratovolcano rising 14,411’ into the air. 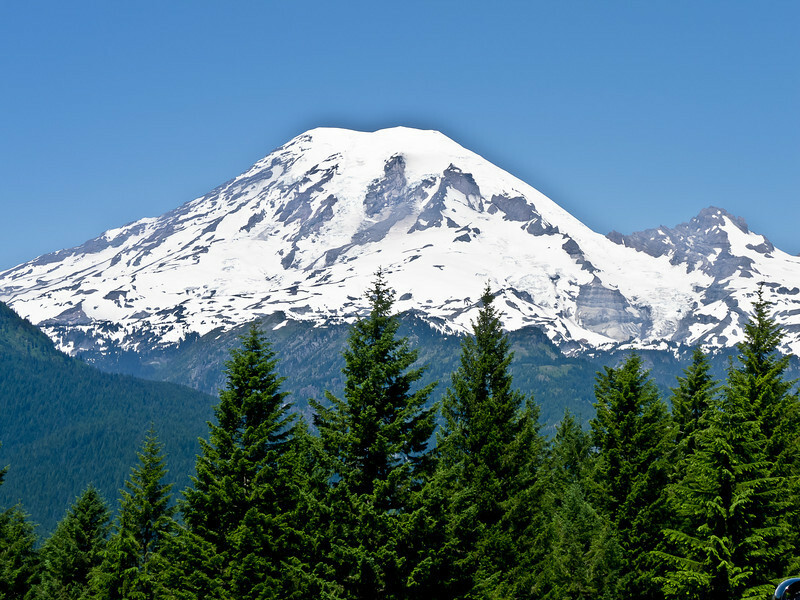 In the language of the Puyallup tribe, it was known as “Talol” or “Tacoma”, meaning “pretty big hill”. 2) Please make it stop! After this picture, I take off my arm and leg warmers, which seems to help a bit. Wait. So you can *drive* up here? That wasn’t in the packet. As continue to climb, a strange thing happens. It’s 60 degrees out in the sun, but it has been unseasonably cold this year and snowed very late, so there are some shaded sections that still have a considerable amount of snow off to the side, and the temperature drops into the 40s whenever we get near one of those. We’re also starting to get enough altitude to notice the lack of air; at 4000’ there is about 10% less oxygen than at sea level. There is also 10% less nitrogen, carbon dioxide, and argon. Finally, we crest the top, where there are people with cowbells (I think – there were people there directing us, that much I am sure of. Perhaps I imagined the cowbells. In retrospect, I’m less than certain the rodeo clowns were real). The park service doesn’t let the ride go all the way up to Paradise any more, which means that we get shortchanged 550’ of climbing. I’m okay with that. We head over to the water stop at Inspiration Point. Looking back at the data from this section, in the 17 miles I climbed about 2800’, and it took me almost exactly two hours, for a climbing speed of 2800/120 = 23 feet per minute. Which is *slow*, even for me – I’d expect something more like 30 feet per minute. Along the way I stopped 7 times. But I made it, and now I just have a short climb, a long and ugly climb, and then a 30 mile slog left. In case you were wondering, the climb from Eatonville up to Inspiration point would probably rate as a Category 1 climb in the TdF, though you could argue for Category 2 because it’s really not that steep. That puts the total climbed around 5100’. I grab some water and mix a new bottle of nuun. It’s actually cool enough that I put my vest back on for the descent, just like the do on the mountain stages of the grand tours. Now it’s time for some fun. It’s sunny, the food stop is coming up, and it’s all downhill. Reflection lakes. Like a tourist I stop at the first pullout, and miss the better one slightly down the road. Except for the one picture stop, I ride it straight through, and it’s a delightful descent; the pavement has a fair bit of tar patching but is generally pretty good. The ramrod map says that this is 13 miles, but it only shows up as 8 on my GPS. That calculates out to about 26MPH average which seems about right; there are a couple of tight turns that I did pretty slow, and I was generally in the low 30s on the descent (trying to go aero when your back is hurting is a bad idea). I pass 3 or 4 guys, get passed by the same amount. The scenery is just what you would think it would be; gorgeous. I do make a mistake; I should be hydrating on the way down to try to get back some of the fluid I lost on the climb. Somewhere on the descent, this happens. That’s pretty good; I might even buy that one. The food stop is crowded; I have some potatoes with salt and a cookie. I skip the fruit because I have problems with fructose when I’m riding. I head out to do the next climb, and short one. I’m refreshed from the descent, and this climb isn’t that bad, in the 4-5% range IIRC. Partway up there’s an overlook and I stop to take a picture; you can tell how much farther away we got on the descent. I take a picture of a motorcyclist, and then head out to continue climbing. That turns out to be the only stop I make on that climb. When I talk to people about climbing, I always tell them that steep climbs (like Zoo hill in Issaquah) and mountain climbs (like the one up Paradise) will change how you look at hills. It certainly happened here. Backbone ridge is about 700’, which is a decent climb in Bellevue terms, but I’ve just gotten settled in when I’m surprised to see the checkpoint tents; it’s taken me 22 minutes to finish the climb and I don’t feel bad. The checkpoint staff write down our numbers as we roll by, and we head out for another descent. This has the makings of another great descent; 5 miles with a decent pitch and no traffic, and it would be, except for the fact that the pavement is bad. As you start the descent there is a sign that says "warning: bad pavement”, and people telling you the same thing, in case you didn’t remember the warning in your ride packet. They’re right. There’s a combination of frost heaves that push the pavement up a couple inches, ridges that fall off, little sinkholes where the pavement has dropped away, you name it. The organizers have done their best to mark them, but the lane is often in partial shade and they can be a very hard to see. I move around a lot to find the best pavement and stand on my pedals to use my legs as shock absorbers for the stuff I can’t avoid. It’s challenging but still fun, delta the odd jarring jolt when there’s something I didn’t see or can’t miss. I do get to do a couple of bunny hops, but I’m trying to be conservative, so it’s not fast, only the mid 20s. 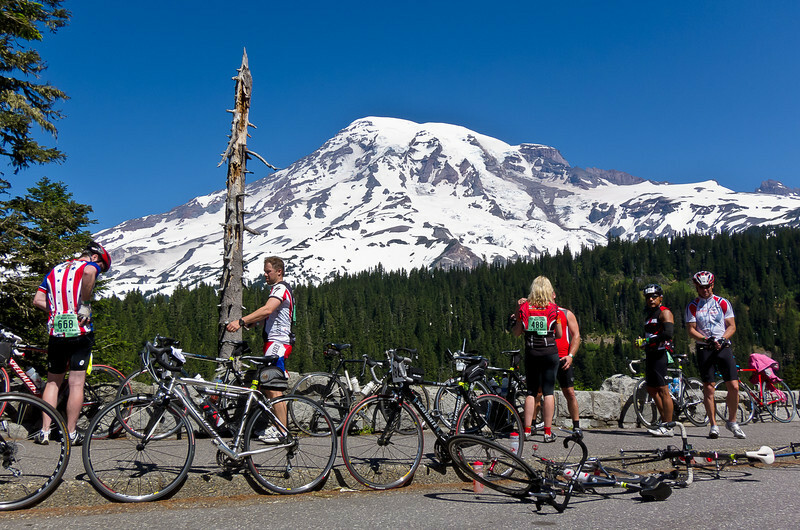 Which brings us to the Cayuse pass climb. It’s really not 323 miles, it’s only 11 miles long, but at 6% it’s steeper than Paradise, and I have 93 miles in my legs already. 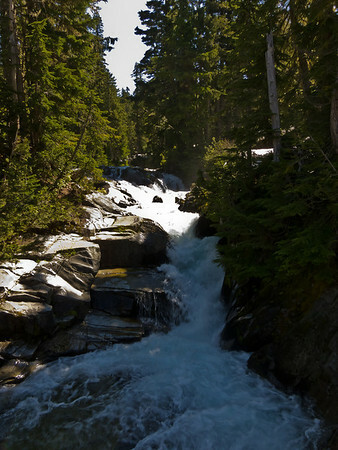 At least I know the climb from the 100 degree inferno RAMROD of two years ago, where we climbed the whole pass from Packwood. 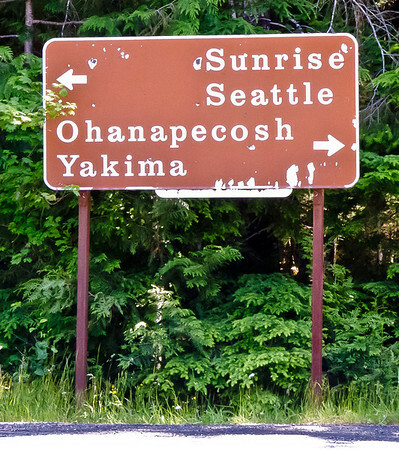 I’m a bit disappointed at the intersection where we pick up the pass; it seems that such an important spot would warrant a decent sign (“Cayuse Pass: 11 miles”), perhaps with a parenthetical warning (“(abandon hope all ye who enter here…)”), but all we get is a very tired sign with a conspicuous blank spot. The first part is fairly flat, but immediately I notice something troubling. I don’t remember if it was like this two years ago, but the surface is chipseal. As chipseal goes, it’s pretty good (they used small round aggregate), but it’s rougher than asphalt and has more rolling resistance, so it’s not what you want to see at the start of this kind of climb. I was not the only one to stop and enjoy for a while; it didn’t come out great in the picture but this one looked like an art director had designed it, a nice fan of water that spread out, and then a small second waterfall into a pool. The climb is unrelenting; you are riding on the side of a hill, so it’s miles and miles with a hill on your right, a valley to the left, and only slight turns left and right, all at a highway-engineer mandated 6% gradient. 7 miles later, there’s a water stop, and I fill up my bottles (one water, one Nuun). I’m having a hard time drinking enough, but I’m still trying to eat (power bar bites and jerky) to keep my energy up. I take another short stop after getting my picture taken exiting the tunnel, and then ride up to the water stop at the top. 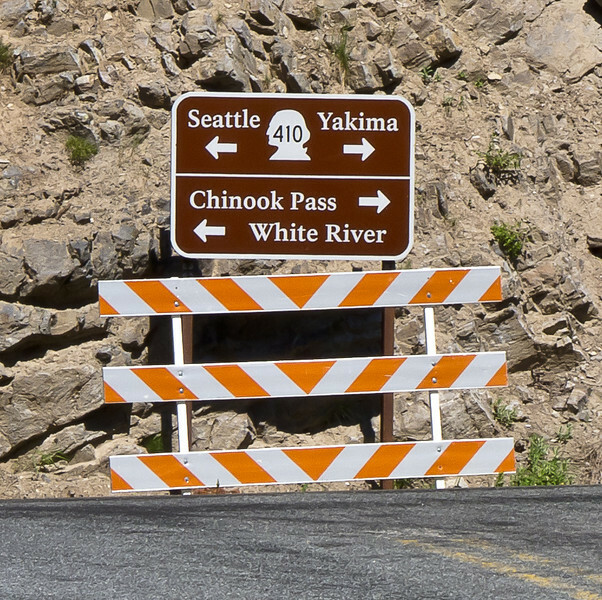 This was going to be a picture of the sign that said “Cayuse Pass, elevation 4675 feet”, but somebody hit the sign and broke it off, so you’re stuck with this. Oh, yeah, we go left again (If you want an extra 800’ of climbing, you can climb to the top of Chinook pass and then come back down again). That little trip to the top added another 2450’ of elevation to the day, putting the total somewhere around 8200’ total. And down we go again. Another nice downhill is the reward for all of our suffering. The first 8 miles is about 6% gradient, and goes by in 15 minutes, with an average well above 30 MPH. The road is pretty nice and the hardest part of the ride is done. RAMROD offers custom-made sandwiches at this stop, though you have to wait for them if you ride the speed I do. I do get an ice-cold Diet Coke from a volunteer while I’m in line, and before long I have a ham and cheddar sandwich on whole-wheat bread with Grey Poupon, tomatoes, and lettuce. I grab some chips, and as I’m walking out the other end I hear my name called and look up to see my friend Bret (obviously of no relation to the “Brett” I referred to earlier) sitting down. I’d assumed he’d be long-gone by now given how my day has gone, but he didn’t start until 5:30 and has been taking his time as well. One of the other guys there has been on some of the Eastside Tours rides that I’ve led (and I’m terribly sorry I’ve forgotten his name), so it’s a bit of a reunion. I would have taken a picture but my bike is like, 30 feet across a sunny parking lot and I’m sitting in a camp chair in the shade, so it’s not going to happen. I finish my sandwich and chips. I’d love to sit here longer – we all would – but we all want to finish things up, so we decide to ride down together. 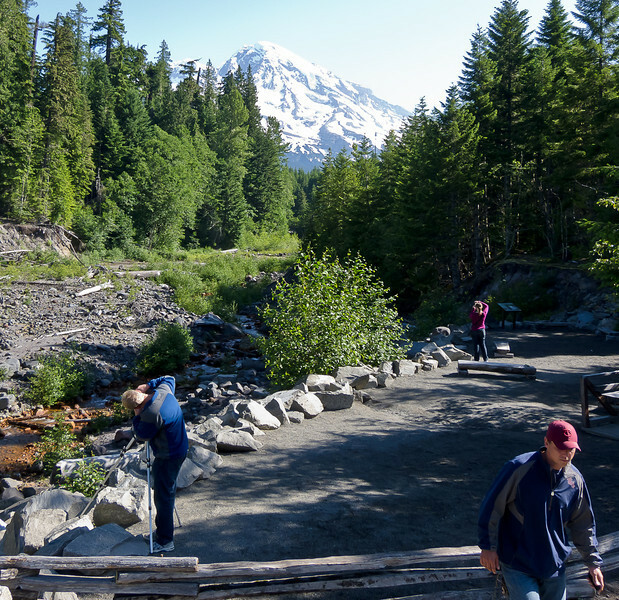 These last miles are gradually descending or rolling except for one final, fast descent down Mud Mountain Dam just 5 miles from the finish in Enumclaw. This is an edited version of the full description, which continues, “…but it won’t feel downhill because you are virtually guaranteed that there will be a nasty headwind”. I’ve done this descent half a dozen times, and there’s always been a headwind. This ride did not disappoint; we could already feel a headwind on the descent to the deli stop, and we were all happy to be in a group. The ride down is most 1-2% downgrade, with a few flat spots and few slight upgrades. On the downhills we were doing low 20s, but on the flats it was an effort to stay at about 17MPH because of the wind. Even sucking a wheel in the back was no picnic. But, the power of the paceline asserted itself and we made it down pretty quickly – 92 minutes for the whole section, or about 20MPH average. It’s mostly relaxing except that they have rumble strips right on the line between the road and the shoulder, and if you hit that at 20MPH, it rapidly gets your attention. I’m also dehydrated but neither the water nor the Nuun I have is sitting well, so I just suffer. Once you get near to Enumclaw you head down and descend Mud Mountain Road, which would be a fun descent if you weren’t so tired and if there weren’t a very tight turn at the bottom. I make it down without doing a Jan Ullrich imitation. And at the bottom of the descent, you’re done. Ha ha, not really. You *think* you are done, you expect to be done, if the world was a fair place you would be done, but in fact, you have another flat 3 miles in the wind. Then finally, you come in to the clapping and cowbells of the finish. As we roll to a stop in the finish gates, I yell, “Ice Cream!” as loud as I can, and as soon as the volunteer pull our “off the course” tickets, we head over to the ice cream truck. I get a lime bar and we head to sit in the shade on the grass. And so ends RAMROD 2011, and this very tired rider heads to the showers. Here’s some data directly from my Garmin. For the ascent value, you could accept the Garmin training center value of 9156’, or the Garmin connect value of 9228’. Figuring elevation gain is a bit of a black art, and everybody gets different values. The calorie value is, to put it kindly, a work of fiction. With how I was feeling, I doubt I was putting out more than 500 cal/hour on the climbs, and probably less on the flats. That would put me somewhere around 5000 calories for the ride. Running a model, I get 1500 calories for the Paradise climb, and perhaps 1200 calories for the Cayuse climb, which makes 5000-6000 a reasonable estimate for the day. Overall, I’m satisfied with my performance on the ride. A ride like RAMROD is right on the edge of what I can do given the amount of time I’m willing/able to devote to training, and if things go not so well, I’m going to have days like I did. Honestly, my feeling not-so-great probably only had a 10-20% effect on the day. As you can tell, I like writing trip reports; if you added up the time that I’ve spent on it it probably comes close to the time I spent on the ride. I like the writing experience, the challenge of trying to convey something about the experience to others who might be interested in trying it, and to those who don’t ride as further evidence (and at this point I should probably just be honest and say “totally redundant evidence…”) of my willingness to do rides like this. I’ve always said that everybody should do something that others look on as just a bit crazy. And I also wrote them for my mother and the rest of my family, so they could keep up on what I was doing. My mother passed away on Memorial day this year; her decline and death were the family issues that I referred to in the intro. 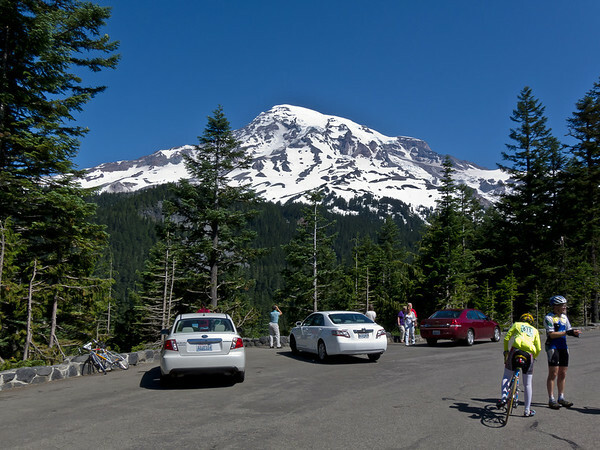 Long rides are one of the things that give me perspective, and it was fitting that my longest and hardest ride of the year would be on Rainier, which was one of her favorite places to visit.